Sadio Mane headed the opener and Mohamed Salah then fired a Goal of the Season contender in front of the Kop. There has been so much to admire about this Liverpool team over the course of a season like no other. Time and time again when serious questions have been asked they have come up with the answers. There have been so many remarkable triumphs, so many performances to cherish, but this one truly belongs in a class of its own. It's been a long time since Anfield was rocked to its foundations quite like this. The sense of euphoria and pride was almost palpable. Pressure? What pressure? Knocked off the summit by Manchester City's win at Selhurst Park earlier in the day, Liverpool responded with the perfect show of force to brush Chelsea aside and regain top spot. Unity really is strength at Anfield and the double-chasing Reds are powering towards the finish line in some shape. On an emotion-fuelled day when Anfield fell silent in memory of the 96 and tributes were paid to the legendary Tommy Smith, Liverpool kept their heads and kept the dream alive. What a way for Klopp to mark his 200th game in charge. Here was what he has built in all its glory. A slick, cohesive unit packed with breathtaking talent but with a steely work ethic running through it. A first home win over Chelsea for seven years was secured courtesy of a devastating burst early in the second half. Salah took centre stage with an individual strike of stunning beauty against his former club. The roar was deafening and the celebrations were wild as Kopites paid homage to their Egyptian King. There was a moment in the aftermath of Salah’s 53rd-minute goal against Chelsea that it felt like Anfield’s foundations were shaking. The visceral roar that followed the Egyptian’s incredible goal was not just the celebration of a remarkable long-distance strike at the Kop end that effectively sealed three crucial points. The Egyptian has scored some memorable goals since joining Liverpool, but usually opts for a deft curl or gentle sidefoot in sending the ball into the back of the net. In going for pure power this time, however, Salah scored arguably his best strike since moving to Anfield in the summer of 2017. Come the end of the season, it could well end up being his most important. There remains a long way to go, and the Reds still require rivals Manchester City to drop points if they are to clinch the crown. The noise was as pure as the hit. Guttural, you could call it. An explosion of joy, of delight, of did-that-really-just-happen-I-think-it-happened. It happened. And there, amid the chaos and the noise and the colour and the madness, stood a single Egyptian, his smile wider than the gap between his current club and his former one. He’s done some remarkable things in a Liverpool shirt, Salah, and he can add this to his collection. He could play until he’s 50, but he will never strike a football more sweetly. The goal of the season? It’s certainly one we’ll be seeing for many years to come. Ferocious long-range shooting is not Salah’s stock-in-trade, but he chose a good time to show off his new-found skill here. The King was back on his throne today. From an unhelpful angle, and with Jorginho closing him down, Salah let fly with a 25-yard strike of unerring brilliance. Think Robbie Fowler against Aston Villa, or one of Steven Gerrard's many, many piledrivers. It was that good. Kepa Arrizabalaga barely smelt it. It flew past the world’s most expensive goalkeeper, straight into his top right-hand corner. As the tension grows, Klopp’s side are keeping their heads. They're comfortable where they are, comfortable with who they are. They look like they believe. It was a bolt through the blue, a high-velocity reminder of his brilliance. A stunning sword-thrust that emphatically announced this Premier League duel is going down to the very last attack and counter-attack. Mane had already nodded his side into the ascendancy but then came Mohamed Salah’s strike. The same Salah who, apparently, has not quite been himself throughout this campaign. His purest of rising hits from 20 yards was not, strictly speaking, the game-winner. But it was a moment symbolic of the special season unfurling at this club like a giant Kop banner. 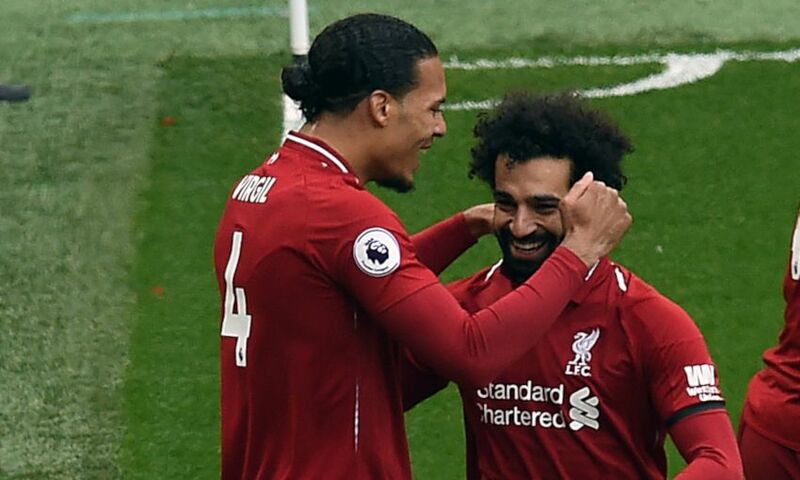 It was his 19th Premier League goal of the season and while Virgil van Dijk leads the Liverpool challenge for end-of-season individual accolades, Salah has also been outstanding … just not as bizarrely outstanding as last season. There were also fine displays from Henderson and Fabinho.